For Iron Man fans, half the excitement of every Marvel movie is getting a glimpse of the latest armor. Tony Stark is a genius, and there's nothing he loves more than reinventing the wheel. That means every single Marvel film features Stark wearing a whole new set of armor, with powers and abilities like nothing we've seen before. As you can see, this latest Iron Man armor seems able to change shape and form. It morphs into a range of energy-weapons, and even what appears to be a blade, while it also has bug-flap wings for flight. That's an intriguing touch, differentiating the armor from anything we've seen in the MCU before. 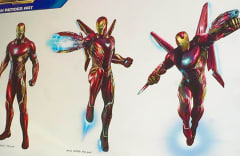 Previous Iron Man armors have used the palm-repulsors to stabilize flight, but that's clearly being done by the wings now, freeing up Stark to use his hands for weapons. The overall design, and the suit's capabilities, strongly suggest that this is the Iron Man "Prime" armor. Created by Brian Bendis and David Marquez back in 2015, the Prime armor was Stark's most versatile to date. In the comics, Stark built it when he realized he'd been so busy being a superhero that the world was catching up with his tech. Frustrated, he completely reinvented Iron Man, creating a phenomenal suit that combined all previous abilities into the one model. It used nanotech to change shape and form, morphing from stealth to Hulkbuster at will, and was host to a whole range of new functions. One of the most impressive was a battery-draining zero point energy bubble, a blast of energy that could take out all but the most powerful threats. I kind of think of the armor as a super hi-tech Lego set; it can expand into a giant Hulkbuster or contract to a skin-tight ninja-like stealth suit. It can go underwater or launch into orbit. The "edgy" aesthetic was inspired by contemporary car and aircraft concepts, and Marquez called out the Lamborghini Aventador and fighter jets like the F-22 and YF-23 as particularly influential. The visuals are clearly recognizable, so we can be confident this is the Prime armor. Excitingly, that means the Iron Man of Infinity War will be more powerful than ever before. Previous films have shown just how many versions of the Iron Man armor Stark has created in the Mcu (remember the Hall of Armors in Iron Man 3?). The Prime armor has the capabilities of every single one of them. The Battle of New York shook Tony Stark to the core. Since then, he's worked hard to find a way to defend the world from future cosmic threats. His hopes of creating a planetary defense in Ultron proved to be a failure, and the Avengers were left splintered in the aftermath of Captain America: Civil War. It makes perfect sense for Stark to try to protect the world himself, and to do so by creating the most innovative and powerful armor he's ever designed. The Prime armor is a very recent design, one created by comic book writers and artists only two years ago. That said, it was also one of the most creative armors we've ever seen, blending the capabilities of every previous Iron Man armor. The stakes are higher than ever before for Avengers: Infinity War, and it makes perfect sense for Marvel Studios to use this design.